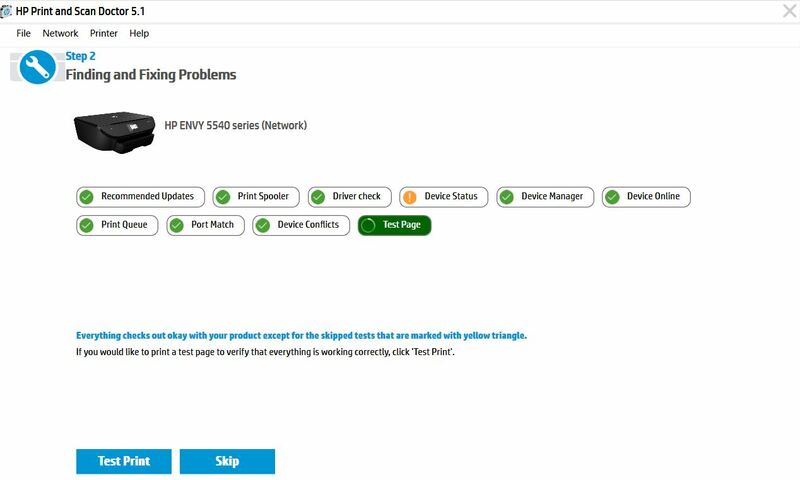 HP provides a free tool called HP Print and Scan Doctor to diagnose and resolve printing and scanning problems. Download and run HP Print and Scan Doctor to quickly and automatically perform several troubleshooting tasks. Select your printer in the list, and then click Next. If your printer is not listed or a connection problem is detected, click My product is not listed or select your connection type, follow the on-screen instructions, and then click Retry. Click either Fix Printing or Fix Scanning. If you see a checkmark , the printer passed the test. If you see a wrench , HP Print and Scan Doctor found an issue and repaired it. If you see an exclamation point , the test failed and required user action, but the step was skipped. If you see an X , follow the on-screen instructions to resolve the issue.